From the get-go, Eliza Desmarais has been determined to be much more than the proverbial pretty face in the organic skincare industry. And CBDC Digby Clare has been there to help her do that. As the saying goes, beauty is only skin deep, and for Desmarais substance is what counts. 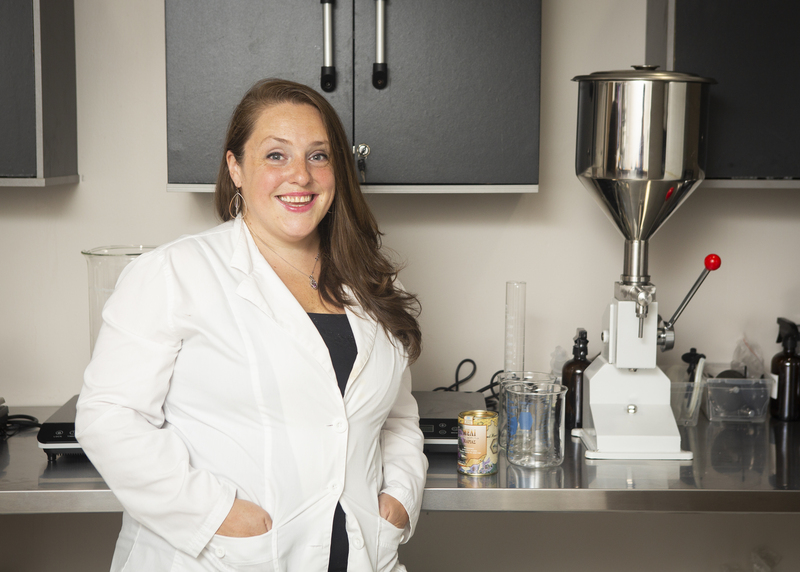 She’s working hard to ensure her Digby-based business, Sohma Naturals is not seen as just another cottage industry making sweet-smelling soaps on a kitchen stove. Rather, she wants Sohma to be regarded as a professional company offering tried and tested comfort to people wanting genuine skincare products. As part of that, Desmarais has built a self-contained “lab” in the basement of her home and obtained a site licence from Health Canada. She follows the EU Cosmetic Directive procedures, such as calculating sensitizers and allergens and keeps her lab separate from the living space, with testing equipment. The EU is one of the only regulated areas of the world in cosmetics. Desmarais’s development of Sohma Naturals has been coloured by a commitment to the integrity of ingredients, expertise and production from the start. She chose to venture into natural cosmetics after she became pregnant and felt the Registered Massage Therapy career she had worked at for the previous 16 years would be challenging to maintain as a new mother. It wasn’t a stretch to lean toward natural products since her mother has owned a health food store and clinic and distributed health supplements in Digby and across Canada for the past 20 years or so. At the same time, Desmarais was determined to steer her daughter’s father away from commercial products toward a healthier regimen. She started experimenting with a few ingredients and came up with some blends that seemed to work for him. “I suppose he was the catalyst for all of this,” says Desmarais of Sohma Naturals. In 2016, she signed on for nine different on-line courses on cosmetics formulation, covering such issues as stability testing and preservation, “and the actual chemistry and science behind making the formulas.” Having studied engineering at Dalhousie University, which included chemistry, Desmarais was adept at getting her head around the science behind skincare products. With some financial backing from her mother, in early 2017 Desmarais and her partner built a self-contained laboratory in the basement of their home. High amperage electrical panels were installed for the specialized equipment she has purchased, such as an induction burner and a dedicated, high-temperature, high-power dishwasher. The lab is also outfitted with High Energy Particle Air (HEPA) filter, incubator, stainless steel work tables, a digital scale, a high shear mixer, and a regular kitchen mixer that she intends to upgrade at some point. In the initial stages, Desmarais distributed some of her formulations among friends and acquaintances to get their feedback. “Basically, the whole community was my guinea pig. I gave away a lot of freebies.” However, once satisfied with the formula, she pursued the requisite Cosmetic Notification Form Identification Number (CNFIN) from Health Canada, which is easily applied for online. Desmarais has also undertaken a lot of research of her own, which led her to get in touch with a Swiss doctor who did a study of the healing properties of 126 kinds of honey from around the world, including the famous Manuka honey from Australia and New Zealand. And ultimately this led her to incorporate Ikaria honey into her signature cream – Blu Mel – which is for seriously dry skin. Coming from one of the Blue Zones of the world where people live the longest, the Greek island of Ikaria, Ikaria honey has the traditional healing properties of other kinds of honey, including naturally occurring hydrogen peroxide, however, it is renowned to be among the purest in the world and free from neonicotinoids, the pesticides that have been killing off bees. “We started getting people trying it on various skin conditions only by happenstance, and we started finding they had immediate remarkable results on everything from rosacea, psoriasis, rashes, cellulitis and diabetic ulcers,” explains Desmarais. Her eczema cream was tested on more than a dozen recipients with eczema specifically. “They all tested five different formulas to narrow it down to the best one. A large majority kept reporting one particular formula out of the five that showed the most improvement. This is how we came to finalize the formula for eczema (cream),” she says. Next was the onerous task of getting Health Canada approval on the product. She hired a consultant who specialized in assisting producers to navigate Health Canada’s compliance procedures, and found an external lab at Université Sainte Anne in Clare for testing for such components as heavy metals and water (an ongoing requirement), and completed the NPN application form, which was “about 85 pages,” She received the product registration a month and a half ago. “Everything is done, so we’re good to go,” she says. She secured a $5,000 loan through the organization. “Just enough to get me through the labels and a bit of the equipment that I needed,” she says. CBDC Digby Clare also connected the entrepreneur with Employment Nova Scotia’s Self Employment Benefits Program, which extended her maternity leave Employment Insurance a little bit longer. And it introduced her to helpful workshops covering aspects of running a business, such as having an online marketing presence. Now that Desmarais has the core of her product and business in good shape, she’s working on ensuring Sohma Naturals has a face forward.